This is one of those movies I could watch every week for the rest of my life. It’s that good. 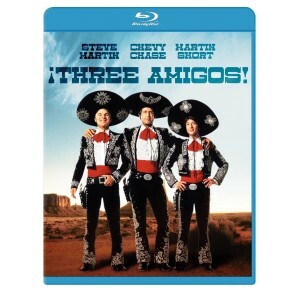 The film follows a trio of silent screen actors who make movies together known as The Amigos. These guys are taken advantage of by the studio and quickly become out of work actors when they demand better treatment, such as actually getting paid to work. Meanwhile there is an evil leader with a giant gang of banditos who terrorize a small village often where one of the naive villagers sees an Amigos film believing it to be real. 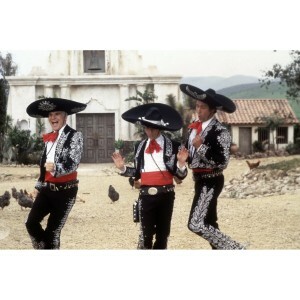 She sends a telegram to the Amigos asking them to help her and her village to defeat the evil leader and his banditos. The Amigos thinking they would make a lot of money for an appearance to put on a show in a small village, accept the invite. Soon they realize, the enemies, the wildlife, and the bullets are real. The comedy in this film is top notch. Three great comedians are at the top of their game in this film and is never boring to watch. I am still trying to write my own script for a stage version of this film. I love it that much. No doubt the whole family will enjoy this film. I hope new generations will take a liking to this movie as much as I did growing up. The ‘¡Three Amigos!’ has a glorious 1080p transfer and is presented in 1.85:1 format. This is by no means the best video transfer I have seen. But certainly it is not the worst either. I think mostly the age of the 25 year old film looks pretty decent. 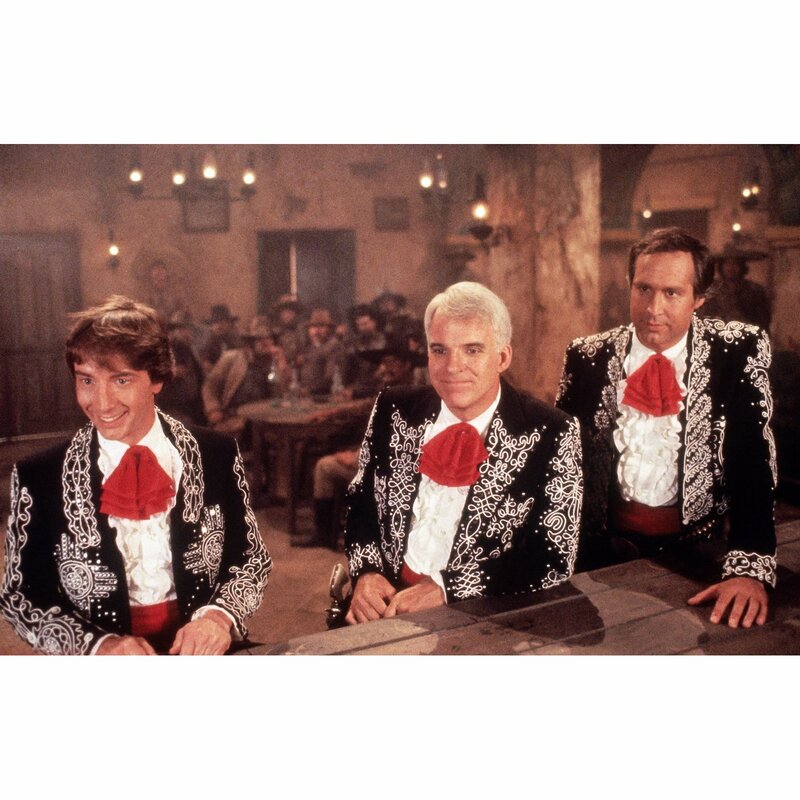 The flesh tones look amazing up close and the fabric of the Amigos’ suits look fantastic. It all stands out. The colors are bright and vibrant, and the blacks are deep and inky with the exception of a few moments where they look clouded. There is a tad bit of noise, but it never lessens the viewing experience. Pretty decent video presentation. The audio has been upgraded to a lossless DTS-HD 5.1 mix and sounds great for the most part. The dialogue is crisp and clear and well handled on the front speakers. The score sounds beautiful and never drowns out the dialogue. The bass is in full force during the gun fights and the ambient noise sounds pretty good throughout the entire system. Although some of the sound FX feel forced and too loud. It sort of takes you out of the experience. But other than that, it is a decent audio mix. Cast Interview (SD, 6 min) — This is an excellent vintage feature from long ago that has Martin Short, Chevy Chase, and Steve Martin talking about making the film. You can see they are all friends and had a great time making the film. Deleted Scenes (HD, 19 min) — WOW. Loved these deleted scenes. One that sticks out is an alternate take on the beginning of the film. 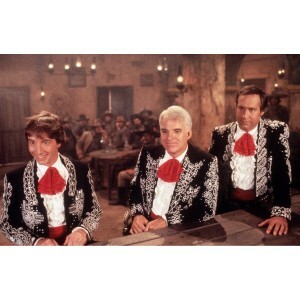 I love ‘¡Three Amigos!’. I can’t wait to watch it again and show it to my kids. I know they’ll love it. But, I just have a feeling that there will be a big badass edition of this movie coming out soon. Maybe for 30th anniversary. I would think they would want to go back to the negative o the film and clean it up a bit more to make it perfect. And I think everyone wants a cast commentary and outtakes. I can only hope this will come too. But until then, this version is the best one to have. It is far better than the DVD release and is packed with a couple of great extras. Definitely worth picking up. This entry was posted on Friday, January 6th, 2012 at 6:46 pm	and is filed under Film. You can follow any responses to this entry through the RSS 2.0 feed. You can skip to the end and leave a response. Pinging is currently not allowed. « Seth Rogen To Direct His First Movie With ‘The Apocalypse’!! !